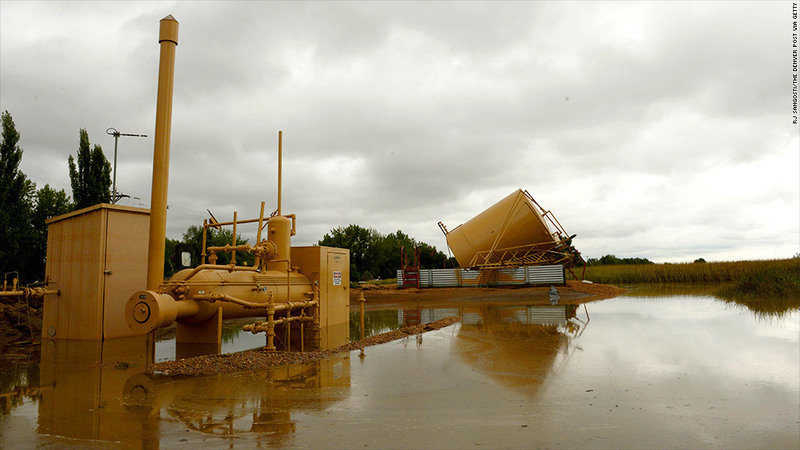 A gas well is flooded near La Salle, Colorado. Some fear the floods may unleash fracking toxins into the drinking water. Not only have the Colorado floods claimed lives and thousands of homes, they have also hit oil equipment, sparking fears that fuel, heavy metals and hydraulic fracturing fluids may be seeping into the local water supply. Over 1,800 oil and gas wells in areas of Northwest Colorado impacted by the flood have been turned off, according to the Colorado Oil and Gas Association. The extent of the damage is not yet known, but local environmentalists have been posting photos of tipped over oil tanks, flooded well sites and broken pipelines. They fear the worst. "The damage is not contained," said Robyn O'Brien, a Boulder resident and food activist. "The public is very concerned about it [and] its impact on water supplies, both for communities and for the massive amounts of farmland and livestock out here." The Oil and Gas Association said it didn't know of fracking operations in the area at the time of the flooding or of any major oil spills as a result of the flood. But that doesn't mean chemicals or petroleum stored in the vicinity have not escaped. The main concern is not so much leaking oil or gas wells, but that the chemicals and other toxic fluids associated with the drilling or production process have been washed into the environment, said Miriam Rotkin-Ellman, a public health scientist at the Natural Resources Defense Council. During the construction of an oil or gas well, millions of gallons of water and chemicals are often sent into the earth as part of the fracking process, which is used to crack the rock. That mixture, which often takes on additional, naturally occurring contaminates such as lead or radioactive elements, is then pumped back to the surface. It's sometimes stored on site in large ponds or in tanks until it can be disposed of. The flood waters may have washed some of this slurry away, along with any chemicals or fuel stored in the damaged tanks. From there, the toxins can end up in rivers or lakes used for drinking water, or run into water wells that have been damaged by the flood, said Rotkin-Ellman. Longer term, the contaminants could stay in the soil once the flood waters recede and find their way into the food supply. Potential toxins could include benzine, ethylene, sulfuric acid, formaldehyde, lead and arsenic. "The potential for damage is huge," she said. The state and the industry will have to be vigilant about testing and, if necessary, fixing any problems, said Rotkin-Ellman. The Oil and Gas Association said industry personnel are monitoring their wells around the clock, and are addressing issues such as damaged equipment or turning off more wells as problems arise. The Colorado Oil and Gas Conservation Commission said it is identifying wells and equipment in the flooded areas and is forming teams of inspectors, environmental specialists and engineers to assess the damage once the flood waters subside. But as of Tuesday, the agency said it had "limited information about specific impacts or particular locations," and is urging residents to avoid contact with the water as it could contain a variety of toxins, not just ones that are oil-related. Colorado is one of the states at the heart of the nation's energy boom -- a boom that could see it one day producing more oil than Saudi Arabia, but one that is clearly not without risks.